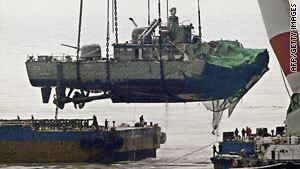 The South Korean naval ship Cheonan is lifted by a crane onto a barge in mid April, 2010. NEW: Ambassador says North's defense contained "very little substance"
(CNN) -- United Nations Security Council President Claude Heller said that the U.N. body is "gravely concerned" about tensions between North Korea and South Korea after hearing presentations from both sides Monday into the sinking of a South Korean naval ship in contested waters in March. After their presentation, civilian and military members of the South Korean investigative panel called on the council to "take timely and appropriate measures" against Pyongyang for its role in the alleged attack. Heller said the council is concerned over the potential "impact on peace and stability on the Korean peninsula" as a result of the March 26 sinking of the Cheonan ship. Forty-six sailors died in the incident. "We presented and explained to (the council) the evidence that the Cheonan was sunk by a torpedo, which was made in North Korea, and launching was also done by a North Korean ... submarine," said Yoon Duk-yong, a science and physics professor serving as a civilian expert on the South Korean panel. The Japanese ambassador to the U.N. made brief remarks following the two nations' presentations, saying "there is no other explanation" than that the South Korean ship was sunk by a North Korean torpedo. North Korea has repeatedly denied any responsibility in the sinking, and Takasu said Monday that the North's defense of the incident contained "very little substance." "Basically they claimed that it is not South Korea, but North Korea that is the victim," Takasu said, adding that when pressed, the North's delegation couldn't elaborate further on the allegation.